In case you were wondering, once your family has gone to all the trouble of eating for a year without added sugar, the world does not go away. People still ply your kid with armloads of sugar from every conceivable direction. Bowls of well-intentioned free candy turn up in the strangest places: The hairdresser’s. The bank. The dry cleaner. The Farmer’s Market, for crying out loud. And just in case that fact had escaped my notice, I’d have become aware of it whenever I wanted to wash one of Ilsa’s jackets or coats, because like a little mouse thinking of winter, she squirrels away the free lollipops and Hershey’s kisses and Lifesavers in her many pockets. Here’s the funny thing though: they stay in her pocket. And just in case you think I’m suffering from an acute case of Mom Deluding Herself Bigtime, here’s another interesting fact: all that candy masquerading as Valentines that the kids exchanged in school two weeks ago? Ilsa’s not inconsiderable portion thereof is still sitting in our kitchen cupboard, untouched. It’s in good company, because it sits on top of the candy she’s received at various birthday parties and Christmas. At the very bottom of the pile is her large sack of Halloween candy: also largely untouched. This is, mind you, on the very bottom shelf of the cupboard, well within my kids’ reach. Now, did I say “largely untouched”? Yes. Ilsa and Greta have each had, I’d estimate, about three to four pieces of their Halloween candy since they collected it four months ago. As if to drive the point home still further, one child in Ilsa’s fourth grade class who was absent for Valentine’s Day sent home a handful of candy with Ilsa this week so it has yet to officially make its way to the pile in the cupboard. It consists of: three Starbursts, two pieces of bubblegum and a mini package of Whoppers, which have been sitting on the kitchen counter for the last four days, presumably enjoying their solitude. Now- I’m not going to lie to you. My kids do try out sugary things once in a while, almost as if they are checking to see if they are still there, and whether their mom will turn inside out or grow horns when they do it. I make a concerted effort not to. And I think that’s as it should be. The world will continue to do what the world does, and my kids have enough information to make these decisions themselves at this point, if anyone does. They know what I think. And I figure the more I belabor the point now, the more it will backfire. So instead I just quietly hold firm to the things I am in control of: no matter how many times Ilsa tells me she prefers vanilla, I still buy plain yogurt. Dressing up our oatmeal in the morning means adding raisins. “Dessert” in our packed lunches means an apple or an orange. Drink choices are milk or water. Actual, sugar-containing dessert remains a “once every couple of weeks” occasion, and in modest portions. 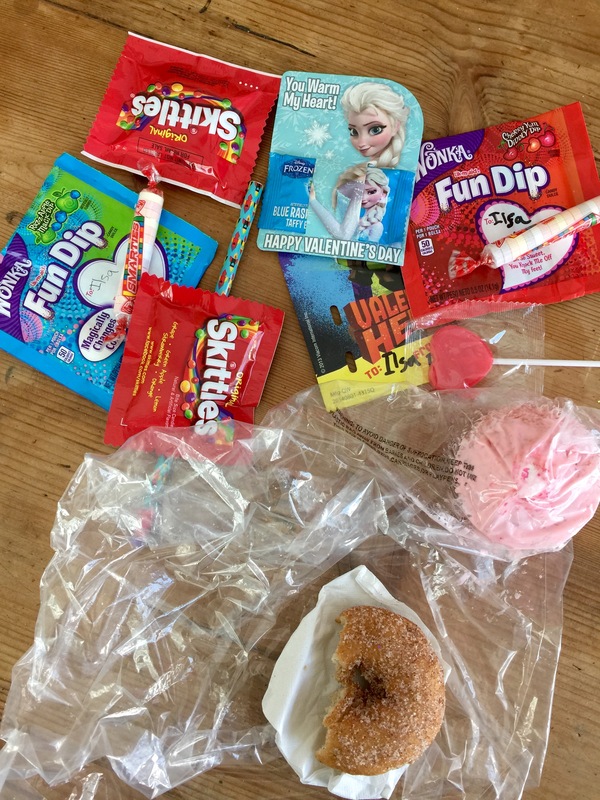 When the kids go out into the world- as they are doing increasingly as they are growing older, and further away from our official Year of No Sugar- they will make their own decisions about whether to choose sugar in their food or not. Two recent occurrences give me reason to suspect, however, that all is not lost. Just the other night Greta (who is now nearly 15) and I were out at an event, and she was offered a tall glass of root beer, which she accepted (after a significant sidelong glance at her mom). Not long afterwards, she interrupted my conversation with some friends to ask if we could go- she was tired. Really tired. She didn’t look well- didn’t look like her normal cheerful self. Amazingly, I failed to put two and two together until we were in the car and Greta did it for me. As for Ilsa, (who is now ten), last week we were lucky enough to play host to a documentary film crew from the popular Middle Eastern show Khawater. For the interview, the affable host Ahmad AlShugairi had requested we have on hand some examples of different high sugar meals and contrast them with no sugar alternatives. I had a lot of fun with this one- we focused on breakfast and I had the bizarro, upside-down experience of trying to find the sugariest yogurts, cereals and pancake mixes on the shelves at my local supermarket. Consequently, after the interview was over and the crew had left we had all this crazy sugary stuff lying around- including a bowl of Cheerios Protein cereal- which despite being marketed as a healthy cereal for adults, has more sugar then even the sweetest kid cereals (17 grams of sugar per 1 ¼ cup serving. Compare that to Froot Loops, for example, which are 15 grams of sugar for 1 ¼ cup serving). Ilsa was curious: could she eat the bowl we had poured as a prop? Hmmm. I reminded her it was veeeery sweet, but told her she could if she wanted to. Just as with Greta’s soda, Ilsa liked the cereal A LOT… at first. About halfway through the bowl she remarked that it was awfully sweet. Maybe she wouldn’t finish it after all. And then she said she didn’t feel all that good. “Yeah, isn’t it amazing what sugar can do when you aren’t used to it?” I said, hopefully offhandedly. Meanwhile, for the last week the rest of the box of Cheerios Protein sits forlornly in our kitchen, untouched. (I kind of feel bad throwing away food- even sugary food- so I’m procrastinating.) I wonder if it’s lonely, but then again, perhaps it will make friends with the Halloween, Christmas, and Valentines Candy. After all, they have a lot in common. Feed the Cheerios to the chickens! Well Eve, intersting reading, especially your two girls reactions to the breakfast cereal. ‘WE” here- Ma and I, are trying hard and, with quite some success at NOT eating products that contain sugar. Difficult to do at times, as you would know. We are now getting lots of food-stuff made in China. HMmmmm. Case last week where imported frozen mixed berries had been fertilised on the farm in China with human ex———–mt during the growing process/time!!!!!!! There appears to be no check on how food is grown in China and then exported to other countries, including Australia. Stefan- Scary stuff, indeed! I figure the more labeling/info, the better. Then again, at a certain point, how much homework are we all expected to do before we can finish our grocery shopping? I now check a whole host of things: ingredients of course, as well as packaging (biodegradable, or landfill fodder? ), and country of origin. And just today another major step was made in our state of Vermont toward the labeling of all GMO foods by 2016- hooray!! But it is quite amazing what we have to investigate just to know our own food. Makes me want to go plant the garden RIGHT NOW! You are currently reading Running the Gauntlet at Eve O. Schaub.